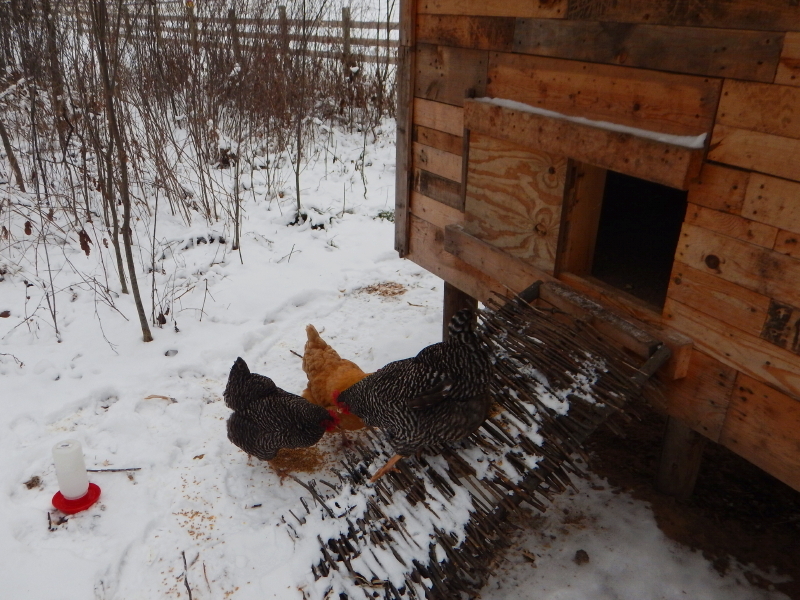 Maybe it was the calmness of the morning, or the fact the temperature didn’t drop significantly overnight, but the chickens wasted little time in venturing out from the confines of the coop for me yesterday morning. Midway through the day, I stopped back to check for eggs and found two of the hens, almost on top of each other, squished into one nesting box. I decided not to bother them, closing the side door and heading off to another project. With Delilah leashed to the double swing nearby to supervise, I spent some quality time at the wood shed. First, I needed to re-stack the majority of the last row that had blown over in the recent high-wind event. With that under control, I started into splitting some of the newest wood from the tree cut down last weekend. I think the fact the wood was now frozen helped the logs to snap in two with relative ease. When Delilah’s interest in watching me work came to its unsurprising end, I dropped her off in the house and headed back to the coop to pick eggs. The Buff Orpington was still sitting in the nest box, but I invaded her space to grab three eggs she was resting on. After lunch, I headed out to turn two different piles of compost that are still cooking nicely, despite the arrival of the frozen season. It seems as though the animals have quickly adjusted to the return of “my” routine of care. Intensified time with Delilah and the horses brings me back to my year sabbatical from the day-job when I managed the ranch full-time while Cyndie was working the Anoka-Hennepin contract. It’s a very fond memory. It’s satisfying to see how quickly the animals seem to recognize the methodical way I do things, easing into the orderly dance of meal time and clean up with me. Today, the chores have increased in number, as an overnight snow dusting has added to the previous paltry amount, making it hardly worth a plowing, but a messy nuisance if I don’t. At least I know Cyndie will be sympathetic. She went to D.C., where they’re getting their own dose of snowfall today.